Signum Inc. (“Signum” or the “Company”) is a leading manufacturer of point-of-purchase (“POP”) product displays and commercial sales kits, primarily for use in the home improvement retail market. The principals of MelCap Partners acting in the capacity of registered agents for M&A Securities Group, Inc., successfully represented Signum and its shareholder in this sale transaction. As the Company’s exclusive investment bankers through this process, the principals of MelCap Partners assisted Signum in selling the business to the best buyer for the business. 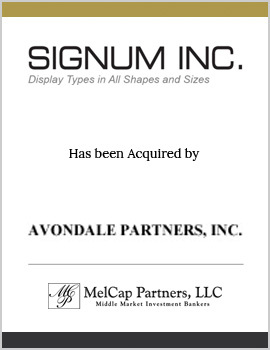 In an effort to provide the shareholder with liquidity, to continue to support the Company’s strategic growth plans, and to provide its customers with continued high-quality products, Signum was sold to Avondale Partners, a private investment group.